being little • bristol uk fashion & lifestyle blog. : blanket. Ah wow that blanket looks awesome! I've wanted one like that for ages. 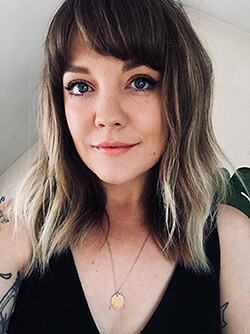 Your fringe is so cute, I've toyed with the fringe idea myself, may have to take the plunge now! you do suit a fringe! the blanket looks so warm. That blanket is so adorable! Your hair is so cute too! I love the colour you have in it too! I just got a blanket really similar to that! I love it too. So snuggly. 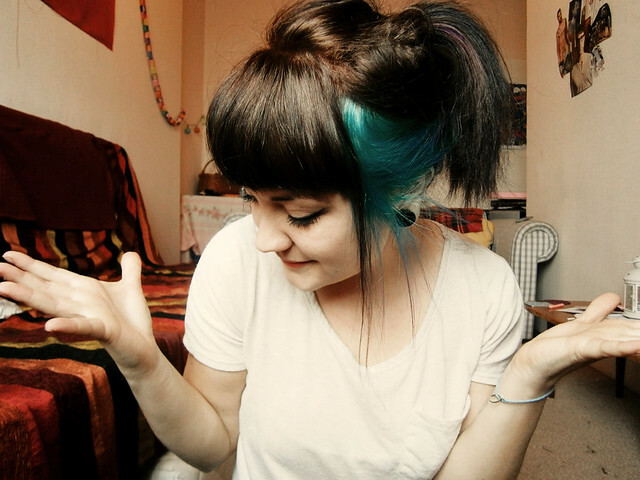 Love the blue strip, I wish I was brave enough to dye my hair! & the fringe is fab. Woehoe I love the fringe! Looks very cute on you! Here in Antwerp we call it 'ne froefroe'. ooooh love those blankets, still got the one my nan made me. They go for a fortune on ebay. I did exactly the same thong with my fringe! I feel like myself again lol! Your hair is really nice, I want a fringe so bad! The last picture is so nice :) I'm currently growing out a 'proper' fringe. Not sure I really like the effect, might take your example and get it cut back in soon. Your fringe looks great, it really suits you. You're brave to cut your own hair, I'm always far too scared. The rug is beautiful and looks so cozy! Totnes!? I live near Totnes! That's so weird. I always read blogs and have no idea where the bloggers from but that's so cool! I hope I'll see you around sometime! That blanket has nanna written all over it. But in a really great way. 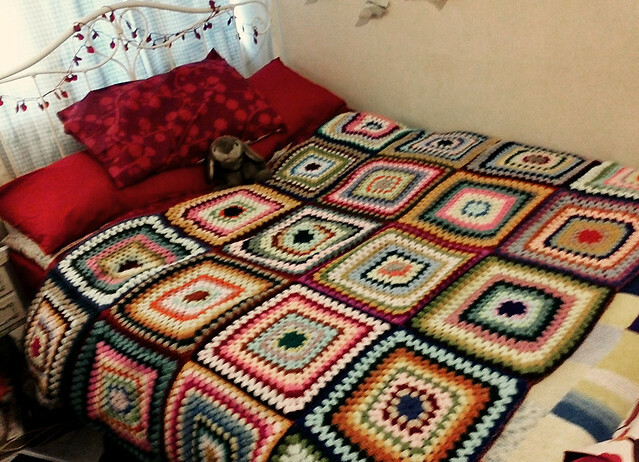 My nan made her own crochet blanket, it was a lot more pink though. I went to Totnes years ago and remember loving it fiercely. Would love to visit again. You definitely look more striking with a fridge, love it! Oh love this blanket, we have one just like it that my dogs has as her bed! She loves it! I attempted to make one when I was younger, my Mum taught me whole to crochet but I wasn't very good at doing the corner so I ended up making a huge circular crochet blanket! 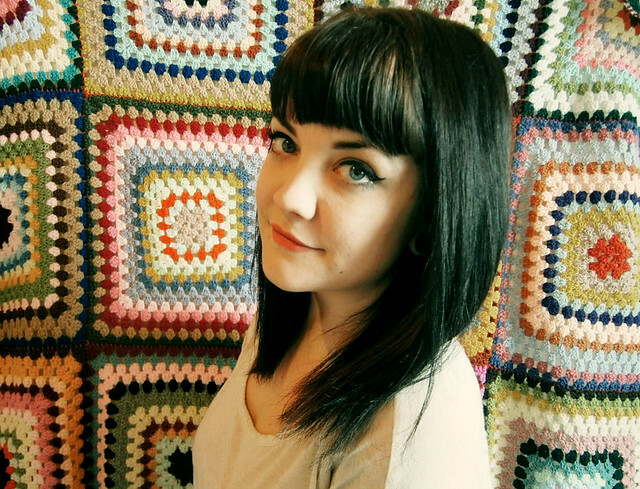 Beautiful blanket, I love your hair, the streaks are so beautiful and your fringe really suits you! aw cute blanket! i have one similar! Your bed does look very comfy, and haha, the different colored eyes reminds me of X-Men: First Class, have you watched it? Because when James McAvoy says "heterochromia," swoooooooon. I think I need a blanket like this in my life, it's so cold at the moment! I love the fridge, and very jealous of the blanket! Amazing.